I'm attending a wedding this summer... Purely as a guest, but just recently found the most perfect pair of shoes for the event... however, my concern? Outshining the bride (unless of course, i give her this website so she could get her own pair)... Which shoes you ask? 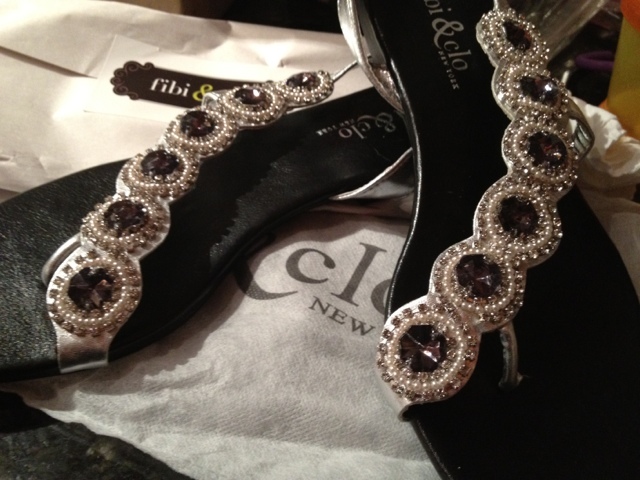 These beautiful fibi & clo sandals - Black Cascade. Aren't they beautiful? And they come in their own pretty little bag to keep them all sparkly and shiny. Now, i've yet to take them for a test run, but the photo below shoes me wearing them inside... they are absolutely stunning (even on my pedicure needing feet). I was quite surprised by how cute they were and comfortable. Now it seems that these sandals are the perfect wedding shoes for a beach or outdoor wedding, or maybe for bridesmaids, but for me, I am wearing them as just a stylish guest. In tote, our beautiful daughter. So Not only will I be a stylish guest but a stylish mom who doesn't need to be afraid of tripping! I'm seeing all sorts of silver linings here. Have you visited fibi & clo website? They have the cutest shoes (and not just for weddings)... It really is a must see. I'll have to do a follow up for when I actually get to put these beautiful shoes to use, but the DC winter won't let that happen for a few months. I am very very excited to put these on and now will have to find the perfect dress to go with them. If you are a bride, bridesmaid, or guest (or just a fashionista) looking for some super cute shoes, definitely check out the fibi & clo website! Check out these popular new trends in 2013 wedding shoes before you purchase for your bridal footwear. Oh, wish to be ob that ground! Very good blog!